Some days at the beach, it’s possible to be so relaxed that you don’t want to get dressed up to go anywhere, but you need to get something to eat. 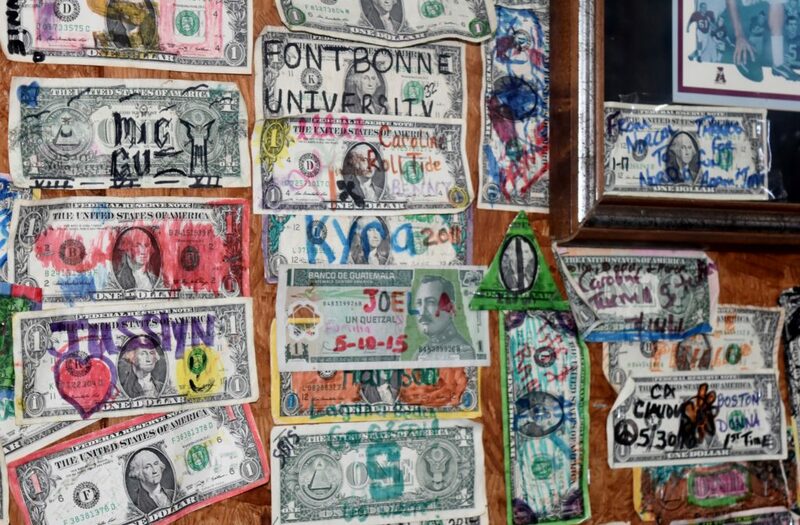 So put on a t-shirt, some shorts, your flip-flops, and head over to the Sunnyside Grill in Panama City Beach, Florida, the 4th stop in Peaches On the Road. This quirky, beach shack has been serving generous portions of classic breakfast fare and homemade comfort foods to hungry beach-goers for decades. Many families have been eating here for so many years that they wouldn’t consider their annual beach trip to be complete without stopping by. When you drive up, don’t let the outside scare you with its overgrown, mini golf ruins. 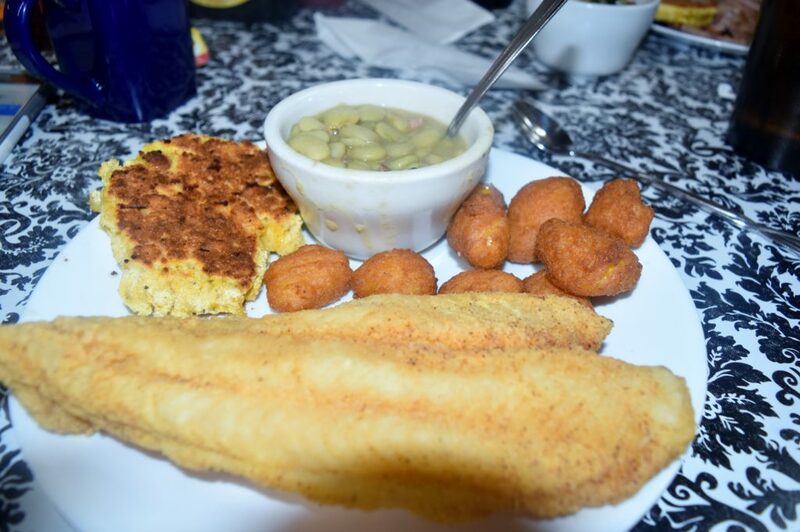 Sunnyside Grill is considered one of Florida’s best hole-in-the-wall restaurants and it’s easy to see why. The service is attentive, the food is delicious, and the prices are reasonable. 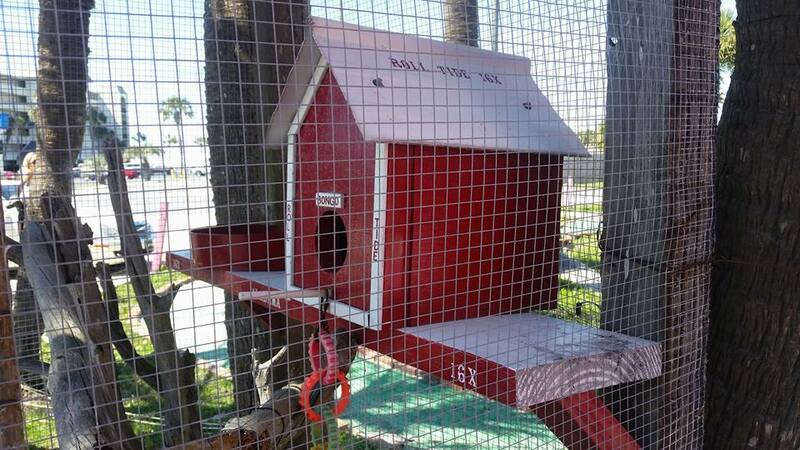 The inside is friendly and laid back with a mom-and-pop diner atmosphere. 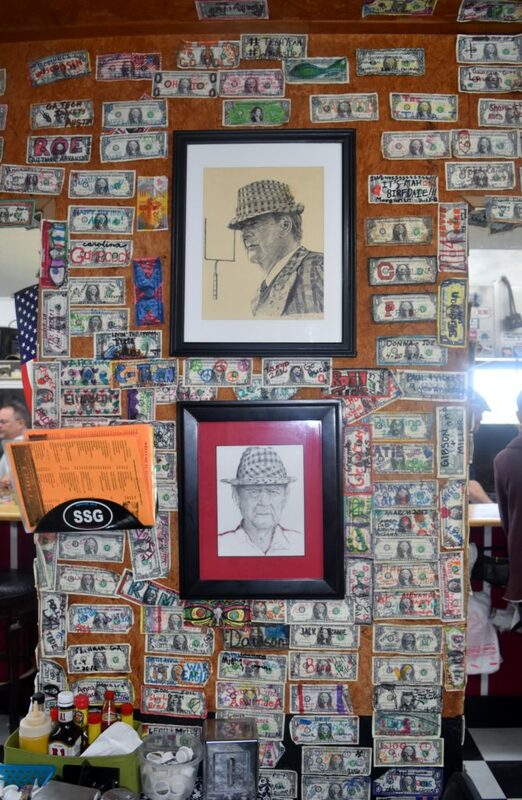 There are hundreds of signed one-dollar bills lining the walls along with an abundance of University of Alabama fan memorabilia. Roll Tide! We visited for lunch and we’ve heard that breakfast is even better. The Catch of the Day was sutchi. No, not sushi. It’s also called Siamese catfish or Swai. This mild-flavored fish was delicious. There’s a nice selection of side dishes. 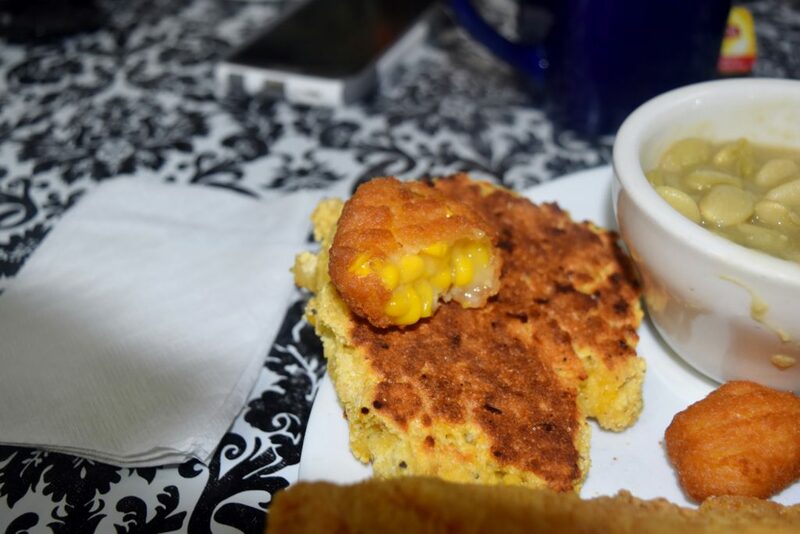 We like the corn nuggets. They’re similar to tater tots, only they’re corn tots. 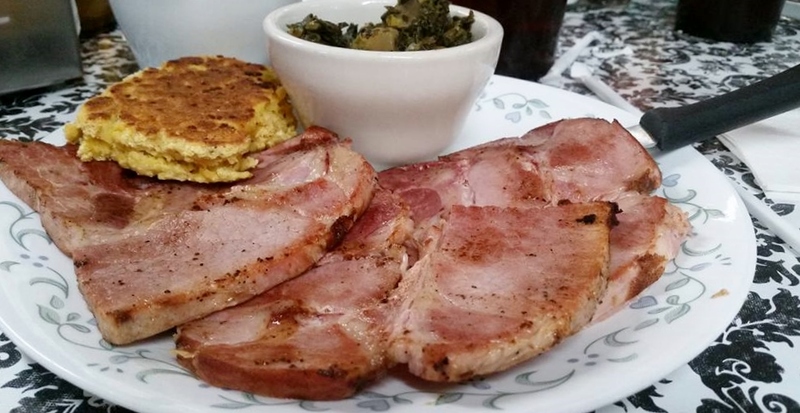 For a satisfying taste of nostalgia, try the Ham Steak with a side of turnip greens and a side of the delicious cucumber salad. P2 says, “It’s the best ham steak ever!” It was tasty and cut-it-with-a-fork tender. 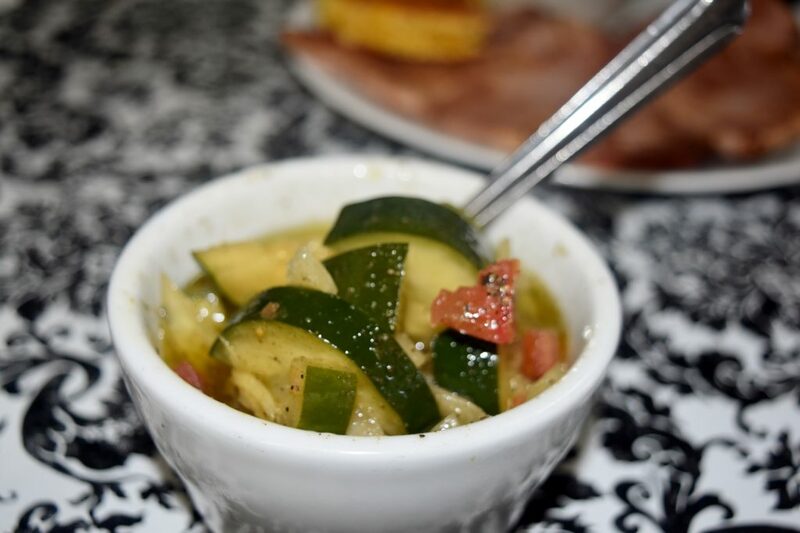 The refreshing cucumber salad contains peppers, tomatoes, onions, spices and oil. Sometimes cucumber salad can be so sweet that it just tastes sweet instead of tasting like the fresh ingredients. This one wasn’t like that. It was perfectly seasoned. 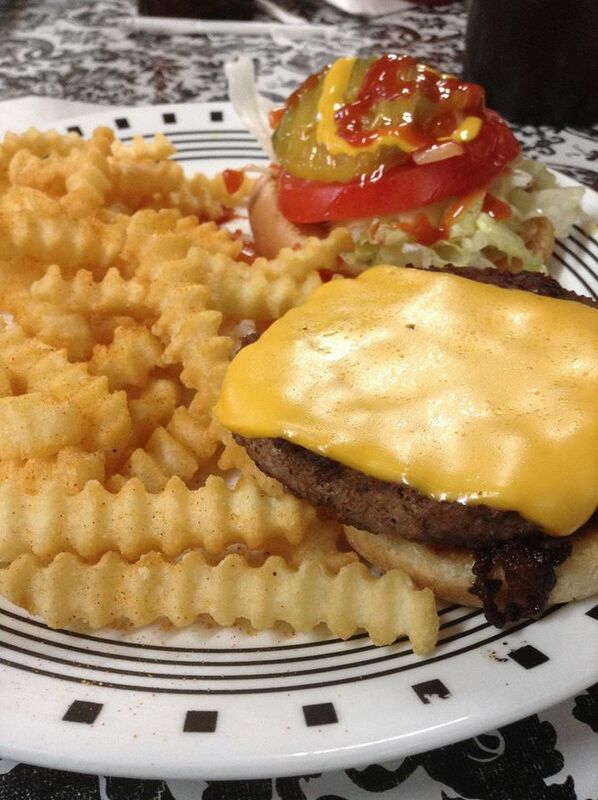 If you’re in the mood for a burger, this is a great place to have one. The Cheeseburger comes with lettuce, tomato, pickles, mustard and ketchup. The seasoned fries are the ideal companion. Get your own, because you won’t want to share. The sweet tea is fresh and cold. Just the way we like it. 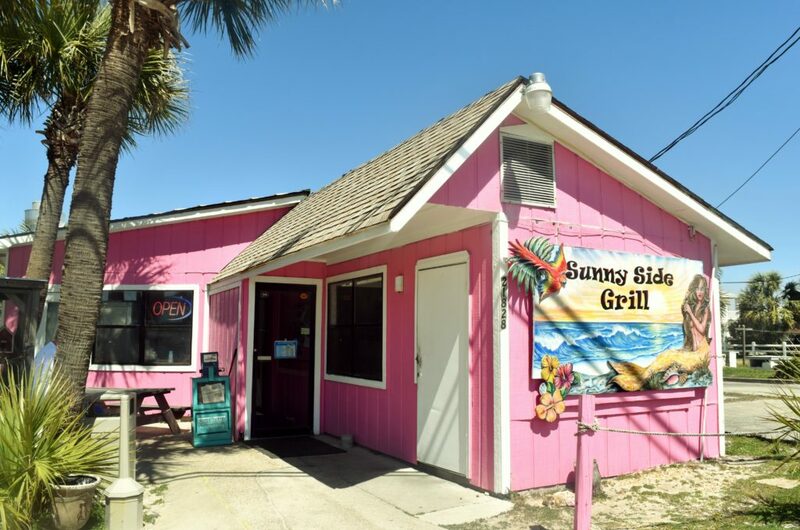 Sunnyside Grill, 21828 Front Beach Road, Panama City Beach, FL 32413. Hours 6:00 a.m. – 2:00 p.m. Wednesday – Monday. Closed Tuesdays. CASH ONLY. No credit/debit cards. No website either, but you can find them on Facebook and there are tons of yelp.com reviews. 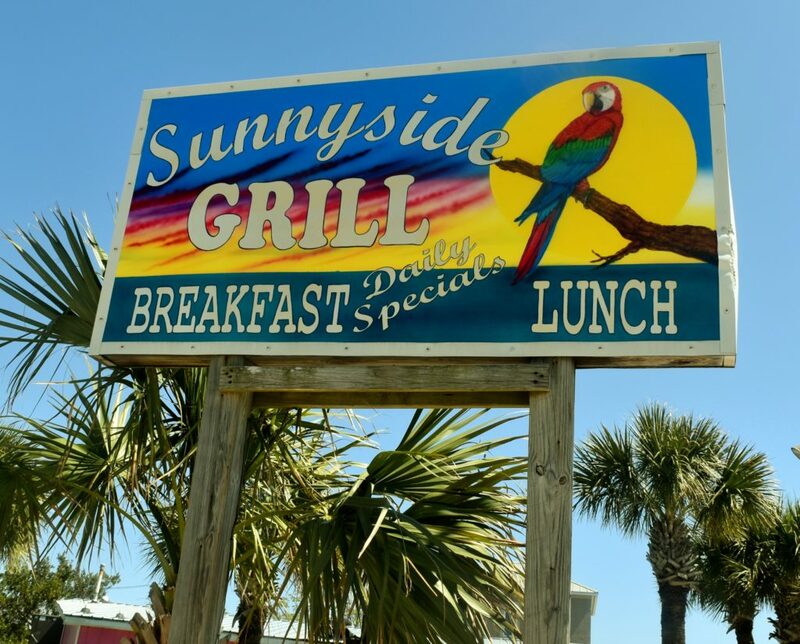 When you go, your GPS may say “Sunny Side Grill” or “Sunnyside Grill.” Either way, its delicious. When you go, be sure to tell them you saw it on pickypeaches.com. Join us next week, for the final installment in our 3-part series featuring simple ways to cut sugar, fat and sodium from your diet. We’ll share easy ways to reduce the salt without reducing the flavor. Once again, I find myself drooling at the great food I’m seeing and wishing I could be away at these fabulous places. Thanks, PPs! You never let me down!